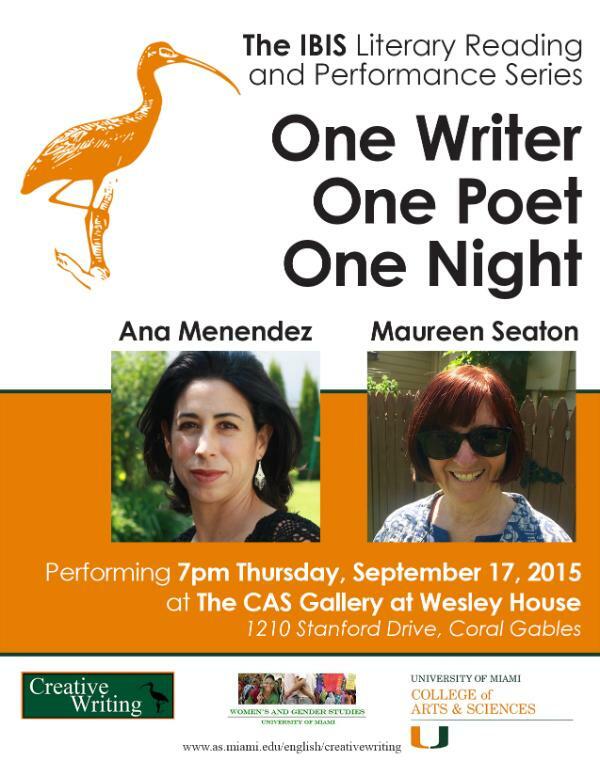 The IBIS Literary Reading & Performance Series, sponsored in part by the University of Miami’s College of Arts and Sciences and the English Department’s Creative Writing Program features three writers or poets in one evening and is free and open to the public. All readings are held at the CAS Gallery, 1210 Stanford Drive, and begin at 7:00PM. 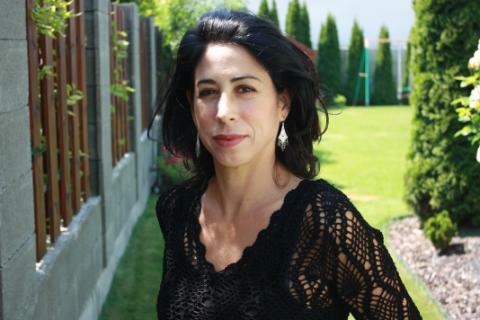 Ana Menendez, is the author of four books of fiction: Adios, Happy Homeland!, The Last War, Loving Che and In Cuba I Was a German Shepherd, whose title story won a Pushcart Prize. She has worked as a journalist in the United States and abroad, lastly as a prize-winning columnist for The Miami Herald. As a reporter, she wrote about Cuba, Haiti, Kashmir, Afghanistan and India, where she was based for three years. Her work has appeared in a variety of publications including Vogue, Bomb Magazine, The New York Times and Tin House and has been included in several anthologies, including The Norton Anthology of Latino Literature. She has a B.A. in English from Florida International University and an M.F.A. from New York University. A former Fulbright Scholar in Egypt, she now lives in Surfside, Florida. Evie Shockley is the author of four collections of poetry—including: the new black, winner of the 2012 Hurston/Wright Legacy Award in Poetry, and a half-red sea—and a critical study, Renegade Poetics: Black Aesthetics and Formal Innovation in African American Poetry. Her poetry and essays appear widely in journals and anthologies, with recent or forthcoming work included in The Best American Poetry, The Best American Experimental Writing, boundary2, The Break Beat Poets, Obsidian, Siécle 21, The Volta Book of Poets, and The Cambridge Companion to Modern American Poetry. Her work has been honored and supported with the 2015 Stephen Henderson Award, the 2012 Holmes National Poetry Prize, fellowships from the American Council of Learned Societies (ACLS) and the Schomburg Center for Research in Black Culture, and residencies at Hedgebrook, MacDowell, and the Millay Colony for the Arts. Currently serving as creative editor on the Feminist Studies editorial collective, Shockley is Associate Professor of English at Rutgers University, in New Brunswick, NJ. Francisco Goldman, a Guggenheim Fellow, is the author of Say Her Name (2011), winner of the Prix Femina Etranger, and of The Interior Circuit: A Mexico City Chronicle (2014) and four other books. He has received a Cullman Center Fellowshi pand a Berlin Prize, among other awards and honors. His work has appeared The New Yorker, Harper’s,The Believer, and numerous other publications. Every year he teaches one semester at Trinity College in Hartford, Ct., and then hightails it back to Mexico City. Shara McCallum, originally from Kingston, Jamaica, is the author of four books of poetry: The Face of Water: New and Selected Poems; This Strange Land,a finalist for the OCM Bocas Prize for Caribbean Literature; Song of Thieves; and The Water Between Us, winner of the Agnes Lynch Starrett Prize for Poetry. Her fifth book, Madwoman, will be published in the US & UK in 2017. Recognition for her poetry includes a Witter Bynner Fellowship from the Library of Congress and a National Endowment for the Arts Poetry Fellowship, among other awards. Her poems and personal essays have been published in literary magazines, anthologies, and textbooks in the US, the UK, the Caribbean, Latin America, and Israel and have been translated into Spanish, French, Italian, and Romanian. McCallum has served as faculty in the MFA programs at the University of Memphis, Stonecoast Low Residency, and Drew Low Residency. Since 2003, McCallum has been the Director of the Stadler Center for Poetry at Bucknell University, where she is also a Professor of creative writing and literature. Laura van den Berg is the author of the short story collections What the World Will Look Like When All the Water Leaves Us, a Barnes & Noble "Discover Great New Writers" selection, and The Isle of Youth, which won the Rosenthal Family ‌Foundation Award from the American Academy of Arts & Letters and The Bard Fiction Prize. Both collections were shortlisted for the Frank O'Connor International Short Story Award. Laura is most recently the author of the novel Find Me. A Florida native, she currently lives in Brooklyn and teaches in the low-residency M.F.A. Program for Writers at Warren Wilson College and in the M.F.A. program at Columbia University.